Designs for our new modern pavilion house outside of Tryon are beginning to take shape. Our clients purchased a 40 acre farm in Columbus, NC with several spectacular old growth oak trees, an existing barn, pastures and distant views to Tryon Peak. To take advantage of the dramatic oak trees, we carefully located the house on the land and oriented the living spaces around the tree locations. As with all of our projects, the existing landscape and our clients vision directed our design concept. The “L” shaped house form organizes the public and private spaces around a large white oak. This allows most rooms to have views framed by the large oak and creates a protected intimate outdoor terrace expanding out from the Living, Dining and Kitchen spaces. Our clients’ vision was a modern pavilion house that could open up to the land, so operable doors and a mosaic of windows connects the living spaces to surrounding landscape and brings daylight in on 3 sides. The single pitch shed roof concept originated as a modern interpretation of the utilitarian farm structures in the area. The main entry for the house is at the low point of the roof and the ceiling height and roof slowly rise as you move through the public spaces of the house. 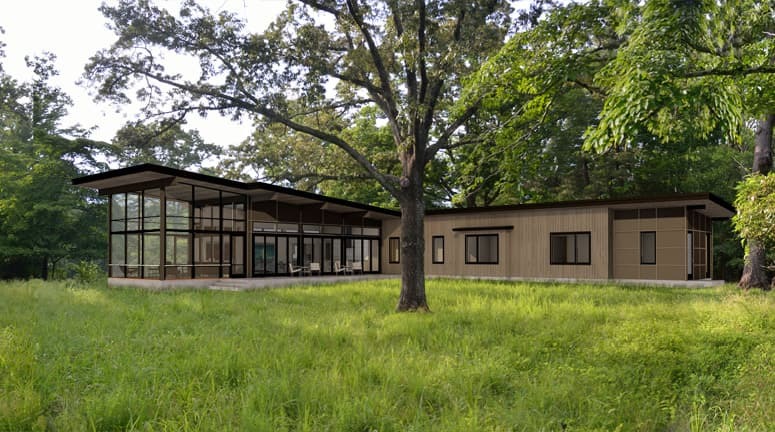 A glass window wall and screen porch create a dramatic termination of the roof line as the living spaces open up to a view of the adjacent forest. We are excited to make our clients dream of a simple modern home a reality.